It’s a grand tradition of the fantasy genre for characters to introduce themselves by listing their family histories. The Lord Of The Rings would likely be hundreds of pages shorter if Gimli didn’t have to constantly remind everyone that he’s descended from Glóin, Gróin, Farin, Borin, and Náin II. But that sort of detailed lineage isn’t only applicable to elves and dwarves: Many rappers can similarly trace their musical “ancestry” all the way back to the 1980s. 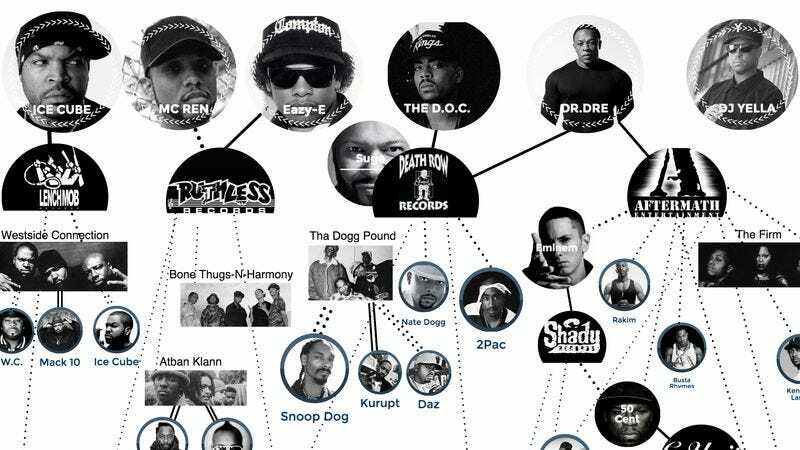 This infographic created by Spencer Stein over at Rukkus explores the surprisingly large “musical family tree” that blossomed from the influential gangsta rap group N.W.A. Through either mentorship or record deals, N.W.A members Ice Cube, MC Ren, Eazy-E, Dr. Dre, DJ Yella, and The D.O.C. (who was a major writer and creative force behind the group) went on to influence the careers of dozens of other rappers and hip hop artists. So for instance, Dr. Dre mentored Eminem who in turn mentored 50 Cent who in turn formed the G-Unit with Young Buck, Lloyd Banks, and Tony Yayo.